You know what it’s like if it’s a Black Tie do and you have nothing to wear! 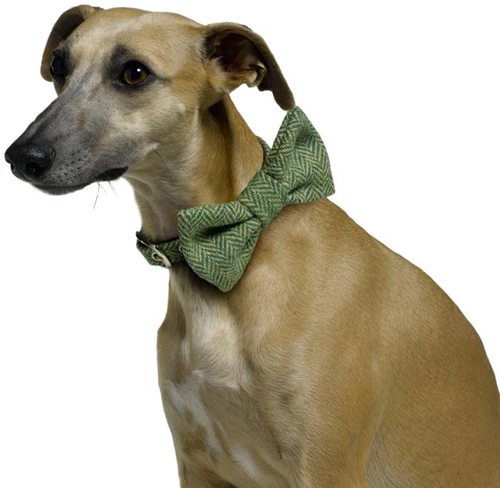 So why not add a touch of splendour to your dog’s outfit with a hand-made bow tie. Slip it on to your dog’s collar to cut a sartorial dash whenever the situation calls for it. These doggy bow ties are made from the finest pure new wool to match all our Tweed collections which includes designer dog collars, leads and dog coats. As with all our canine couture items, our doggy Bow Wow Ties and all the matching items are exclusive to LoveMyDog and come with a Certificate of Authenticity. Shop for LoveMyDog Bow Wow ties here. Lovely! I would love to see my dog wearing that bow wow ties and he’ll definitely look handsome on that.